Paddle boarding is steadily growing as a very popular water activity that doubles as a great workout. Thanks to Orlando Bloom, even naked paddle boarding is now a thing. But don’t let that stop you from taking up paddle boarding (unless that’s what you’re really into). 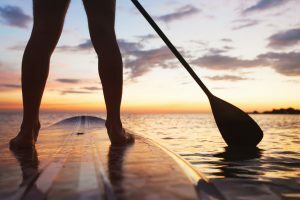 If you’re still undecided as to what activity you should go for this year, here are nine good reasons why paddle boarding is a must-try. 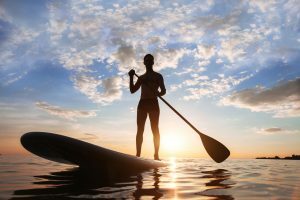 Stand up paddling (SUP) is awesome for people of all ages and fitness levels. It’s very beginner-friendly. Plus, unlike surfing, you don’t have to wait for waves to paddle board. In fact, for newbies, very calm flat water is recommended. So you can paddle board on a river, a lake, or an ocean, which is great for those who don’t live by the surf. Tip: Get the right gear. Some beginners think SUP is harder than it really is because they didn’t get the right equipment. Paddle boarding is a lot easier when you’ve got the proper board and paddle for your weight and ability. 2. It’s a total body workout. It’s no HIIT, but you’ll work out every muscle in your body just the same. Whether you’re trying to stabilize your center of gravity or using your arms, back, and shoulders to propel the board on the water, expect to be constantly working. Per hour, you can burn as much as 500 calories with SUP. Of course, if you prefer to take it easy and do just a casual cruise on the water, your workout may not be as intense but you will still burn calories. 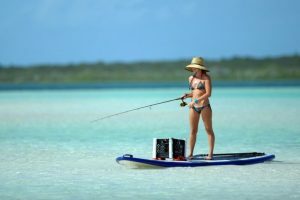 The more you paddle board, though, the more you build lean muscle, which in turn increases your basal metabolic rate so that you can burn even more calories after you exit the water. 3. It’s great for injuries. Paddle boarding is a low impact activity. It doesn’t put unnecessary strain on the tendons and ligaments of the joints, which makes it perfect for those who are recovering from injuries (sports-related or not). If you’re a runner who’s suffering from shin splints or knee and hip pain, SUP is a good alternative workout while you’re healing. You can do this every day to gently increase strength if you want. Once you get the hang of paddle boarding, you’ll want to keep coming back for more. There’s something about the feeling of gliding on the water while connecting with nature. It’s calming and you’re getting your dose of vitamin D, too. Also, since you can’t paddle board indoors, you’ll be forced to go outside and away from all your gadgets. Say it with us: being outside is good for you. You’ll also get front seats to nature so take advantage of the incredible view – above, ahead, and below. Another wonderful thing about SUP: you can take your dog with you. Take a look at these cool doggies paddle boarding with their humans. 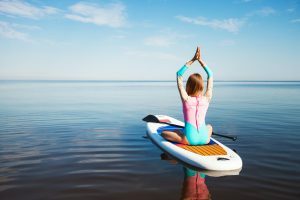 Yoga on a SUP? Why not? There are so many things you can do with a paddle board. You can go fishing with it, use it for an overnight trip, take it down river on a windy day – the possibilities are seemingly endless. Some even use paddle boards to surf but if you’re a purist, this may not be your cup of tea. SUP boards are generally longer than standard surfboards. 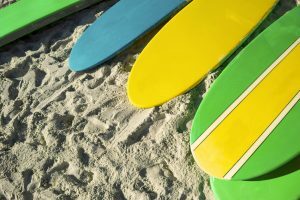 If you use your paddle board to surf, others may think you’re hogging their surf spots. 6. It’s a good investment. Paddle boards, that is. 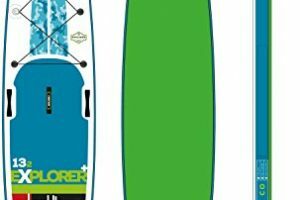 If you’re a beginner you may balk at the price of a stand up paddle board. Good ones cost anywhere between $800 to $1800. This is because SUP boards take longer than shorter boards to be produced and completed. The materials used are also more expensive. A good board will last you many years and its performance will remain consistent every time you go out on the water. But the great thing is that paddle boards hold their retail value. You can resell them for the exact price you got it for as long as you know how to take good care of it. 7. It’s full of health benefits. It improves balance, reduces stress, improves endurance and cardiovascular health. When you’re paddle boarding, you need a lot of leg strength and core stability to keep your balance. It’s also naturally relaxing since water has a calming effect. Even if you’re by yourself and just enjoying the sun, the water, and everything in between, it’s easy to lose track of time and let go of everything that’s been stressing you out. As for endurance, all that paddling will tire out your muscles. But the more you do it, the more you increase your endurance, which is never a bad thing. Lastly, if you’re tired of the usual cardiovascular exercises, SUP is as good for the heart as running, aerobics, and even cross-training. Improved cardiovascular health puts you at less risk for heart-related diseases. Or as challenging as you want it to be. Don’t get us wrong, it’s unlikely you’ll hurt yourself on a paddle board. But there’s no telling when sudden winds will disrupt still waters. In cases like this, just sit down and keep calm. Another way SUP is challenging: You can join simple sprint races or skilled obstacle courses during summer. There are also a lot of SUP competitions for charity so you can have some fun while helping others at the same time. And that means if you’re looking to meet new people, paddle boarding’s the way to go. It’s also a nice way to bond with family and friends. Bring them along on your next SUP adventure and get more people hooked on the sport. We’ve got you covered. 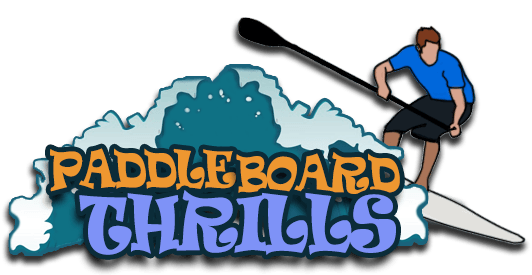 From paddle board brands to dimensions, types, and features, we have all the info you need to serve your paddleboard thrills. 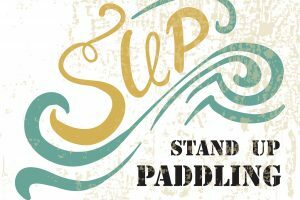 For beginners, don’t forget to check out our Stand Up Paddle Board Guide and How to Paddle Board.